Book Drunk: Reviewed: The Riviera by Karen Aldous. 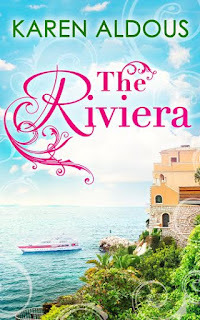 The Riviera is published by Carina on July 10, 2015. I loved Karen Aldous’ The Vineyard back in May last year but I wasn’t quite sure I wanted to let some of the characters go. Cal and Lizzie (and Sophie…) stole my heart and so I was thrilled to learn that Karen was writing a sequel. One summer later, in The Riviera, Lizzie and Cal are now happily settled together, with plans to move in to a new place. Cal has easily bonded with Lizzie’s child Thierry and he’s an adorable little character too. Cal and Lizzie are very loved up but when a mysterious message from Cal’s son Jack comes through, the happy couple are set to face some time alone as Cal heads off to America to help his son through some of his toughest teenage moments. 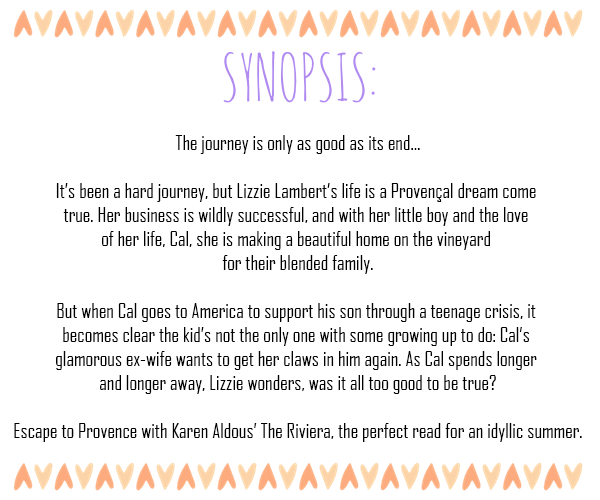 He’s hoping to come back to Provence as soon as Jack is feeling better but with his son struggling, Cal doesn’t want to sacrifice a relationship with him and so things don’t work out entirely as planned. First off, I loved seeing the bond between Cal and his son grow. Cal’s never really had much chance to support his son but you can tell how much Jack values him from the start of this book. Jack was a little sensitive as he let his problems with people from school take over a bit and like most teenagers, he felt like he knew what was best and wasn’t great at following any guidance. I did think that Cal was the influence Jack needed, as with Jack not getting on with his mum’s partner and not feeling like he could talk to his mum, he needed someone to be there for him a bit more and to show some understanding. I found Jack to be really likeable and I liked how he was always thinking of the next step, making plans even if they were unrealistic. He didn’t just sit back without a care in the world. I also loved the way Thierry took to him and how excited Thierry was because he had a new friend and someone maybe a little less girly than his mother. What has always drawn me to Karen’s writing is the beautiful description she uses and how she builds up a setting so evocatively. Again, we really get a good feel for Provence here and how tempting would it be to sit out in Provence, sun shining, book in one hand, glass of rosé in the other? I will say that I found this book took a little longer to settle into than Karen’s others. I think there was a lot of dialogue early on which maybe if it had been broken up a little, explained to us without all the speaking, then it would have been a bit easier for me to immerse myself into the story. But having said that I was soon captured by the glorious setting and the story that was unfolding. When Jack spends his week-long school holiday in France with Cal, Lizzie and Thierry, they take him around Cannes as he explores the area and that was when Karen’s vivid description and ability to make you dream of escaping to the setting within seconds came into play the most. Every sight, every little detail was like a little slice of heaven and I liked how taken by the setting Jack was and how he so easily seemed to fit into the family. When Jack’s holiday is over, it’s back to term time and Cal again heads off with him to see him through. In Lizzie’s eyes, this means he will be spending a lot more time with Jack’s mum Kelly and this is where we see a slightly different side to Lizzie, the mistrust and the overthinking. Lizzie seemed to come to conclusions too swiftly and she starts off with a mere thought and builds it into a massive obstacle. I was really hoping she would see communication was the answer, rather than letting her thoughts take over, because this is Cal and Cal was lovely…! There was more to The Riviera than I had been anticipating, especially in the form of a twist or two towards the end. There were things I was expecting to happen which didn’t and vice versa and I liked the little surprise element to the story. In my eyes there were three strands to this story, Lizzie’s jealousy and fear for her relationship with Cal, Cal’s building of a relationship with his son Jack and then the more minor but equally beautiful part with Lizzie’s mum, Caroline. There’s an underlying theme of family and a sense of belonging and I was entranced by it all. I just can’t get enough of Karen Aldous’ stunning writing and with each dreamy setting, each group of characters I am won over yet again and left eager for more. Stunning sequel to The Vineyard - beautiful read for the summer! I loved this one aswell.